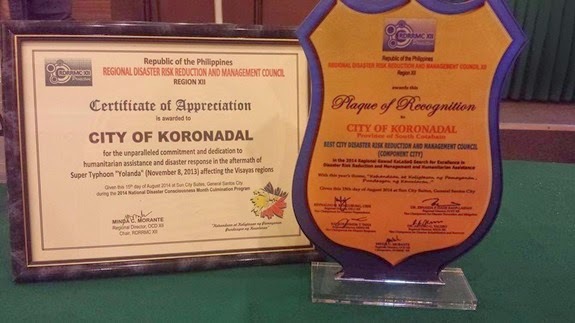 The Municipality of Tupi and the City of Koronadal in South Cotabato were declared regional winners in the 2014 Gawad Kalasag: Search for Excellence in Disaster Risk Reduction Management and Humanitarian Assistance awarded by the Office of the Civil Defense- 12 during the culmination program of the Disaster Consciousness Month held at Sun City Suites in General Santos City on August 15. Tupi's Municipal Disaster Risk Reduction and Management Council (MDRRMC) was named "Best MDRRMC" in Region 12, while Koronadal's City Disaster Risk Reduction and Management Council (CDRRMC) was adjudged as "Best CDRRMC", topping other cities in SOCCSKSARGEN. Also declared regional winners of Gawad Kalasag 2014 were Barangay Poblacion of Tantangan and Barangay Carpenter Hill of Koronadal City which were declared "Best Barangay DRRMC" rural and urban category respectively. The regional winners were automatically placed as national finalists of the 2014 Gawad Kalasag National Awards. Gawad KALASAG is conducted annually to recognize the exceptional contribution of Disaster Risk Reduction and Management (DRRM) practitioners in strengthening the resilience and adaptive capacities of communities to disaster risks. It is organized by the Office of Civil Defense - National Disaster Risk Reduction and Management Council (NDRRMC).